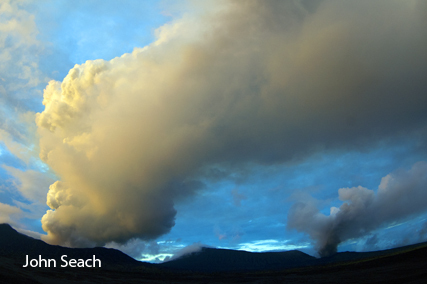 Ambrym volcano is the Jewel of the Pacific. 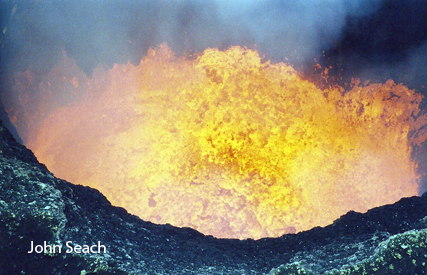 Ambrym Island is located in central Vanuatu and contains one of the world's most active volcanoes. Lava lakes regularly appear in the summit craters. 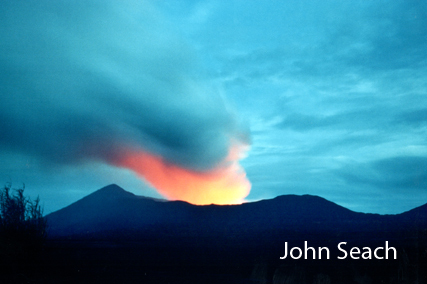 Several times per century, Ambrym volcano erupts violently. Lava lakes disappeared at Ambrym volcano in December 2018 after an intra-caldera flank eruption. 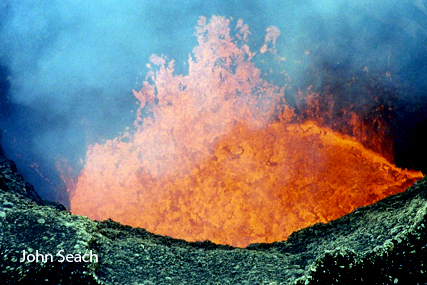 In 1913-14 Ambrym volcano produced the largest eruption in 400 years in Melanesia. The island is located in central Vanuatu along the main shipping lane between Port Vila and Espiritu Santo. The island is also noted for magic, sand drawing, rom dance, and tamtam carvings. There is only one volcano on Ambrym, not two, as incorrectly stated by some people. Marum crater has not erupted in 60 years. Lava lakes regularly appear in Benbow and Mbwelesu craters. 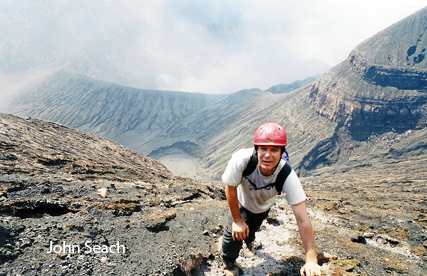 In the 1990's French explorers were the first to descend into Marum crater to view Mbwelesu lava lake. 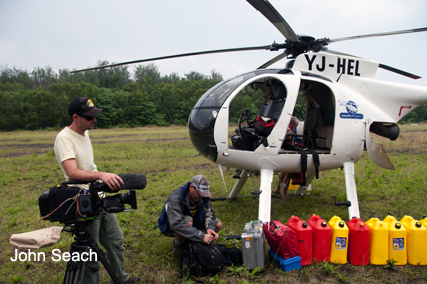 John Seach has been leading tours to Ambrym Island for 21 years. 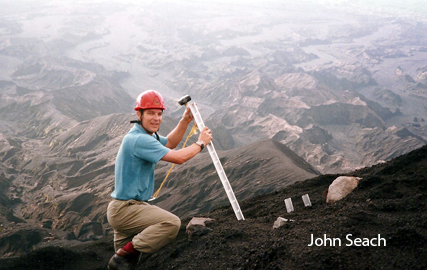 John has been to the craters at Ambrym volcano on more than 180 times. The summit of Ambrym Island contains a desert-like caldera covering 100 sq km. This provides an impressive contrast with the thick jungle covering most of the island. 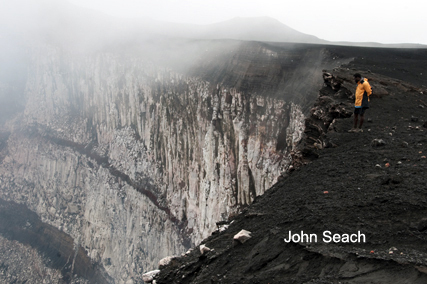 The caldera appears barren but closer inspection shows specialised caldera plants and animals. Even right on the crater rims, there are many insects which thrive in the acid environment. Elsewhere on the caldera there are orchids which prefer the cooler acid environment, and usually fail to survive at sea level. 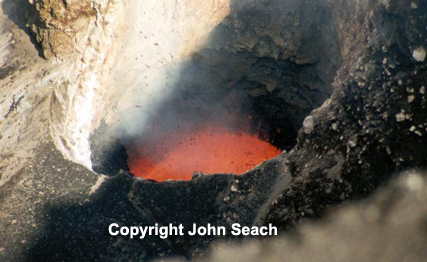 Ambrym volcano was first climbed in the late 1800's and produced destructive eruptions in 1894, 1913, 1929, and 1951. 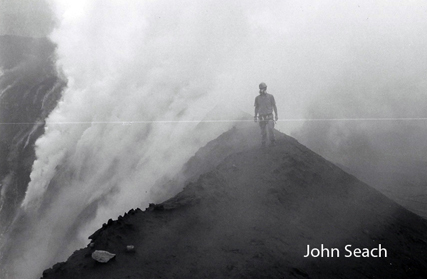 During the 1980's and 1990's activity included lava lakes in the summit craters. Ambrym volcano is unusual because it produces basaltic lava in a subduction zone. 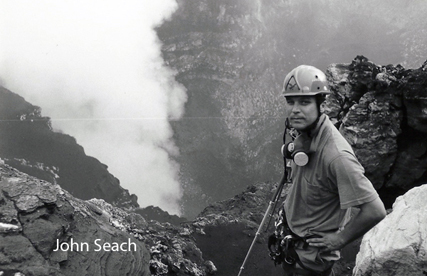 John Seach has been leading expeditions to Ambrym volcano since 1998. 1996-2019, 1994, 1991, 1990, 1989, 1988, 1986, 1984-86, 1983, 1981, 1980, 1979, 1977, 1973-76, 1972, 1971, 1967-70, 1964-66, 1963, 1961-63, 1960, 1959, 1958, 1957, 1955, 1954, 1953, 1952, 1950-51, 1942, 1938, 1937, 1935-36, 1929, 1915, 1913-14, 1912, 1910, ?1909, 1908, 1898, 1894-95, 1888, 1886, 1884, 1883, 1871, ?1870, 1863-64, 1820?, 1774, 50 AD.